An innovative and dynamic building company with a clear commitment to excellence and quality above all else, we are an obvious choice for any project in both the Domestic sectors and for the Commercial arena. After successfully running and operating a large Multi Award Winning construction company (some of which photos are used in this site), we wanted a new challenge and felt there was a gap in the market where clients would benefit from engaging a business with the experience of a professional corporate business structure combined with the one on one intimacy of a smaller firm. We have over 20 years’ experience in the building industry, and over that time we have developed a core group of hand-selected tradesmen, engineers, draftsmen, architects and surveyors who are true professionals in their field. We are family owned and operated company, and with the decision to start a family earlier on in our life, came the second decision, we needed to create more room for the new addition coming into our lives, so having lived through our own renovation first hand, we can completely connect with what our clients are about to face and go through and with this experience we are better equipped to communicate and educate the clients on what they are about to face and we do it in a way that we are not using industry Jargon that just confuses clients, we like to think we can communicate effectively in laymen’s terms. As are our client’s choices, the style of work we do is broad and comprehensive and covers Custom Design New Homes, Extensions, Renovations, First Floor Additions, Bathrooms, Attic Conversions, Secondary dwellings, Investment Properties, Designs and Subdivision’s, so whatever our clients’ needs are, we assess those needs to ensure we are the right fit for them, then we move on from there. 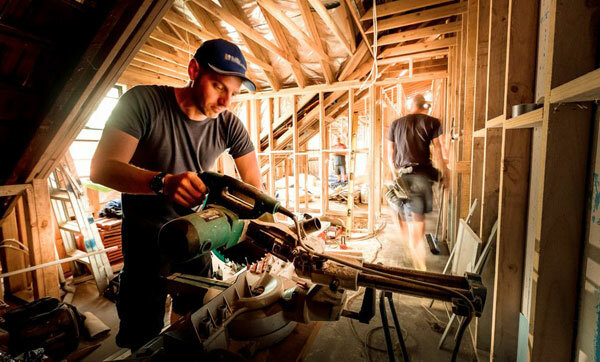 Whether you are renovating, extending or building from the ground up, you need a builder you can communicate with and who understands your needs, and I think once you achieve this platform then trust in the relationship is formed, and this trust is vital to any successful partnership. After a quick conversation over the phone, you will be able to establish if a DANARK representative visit would benefit you. We then organize a site visit to look at the site and to discuss your needs further. Apon our return, your building project begins with a highly detailed Building Plan which includes the points of our discussions and from which our pricing is based upon, with nothing left to chance. This includes accurate budget estimates, complete schedule projections, and itemized material needs. Through every stage of the building process, our team updates you on progress in plain English. When the work is completed, we have already pre-set a follow up for all building maintenance inquiries which ensures your complete satisfaction. So from concept to completion, you get a proven team that delivers extraordinary quality and makes your building project as seamless and painless as possible from start to finish. We pride ourselves on ‘Achieving Lifestyle through Design’ on time and within budget. That’s our promise to you. Copyright © 2017 Danark Constructions. All Rights Reserved.